Features a built-in microphone, LED recording/power indicator, automatic record level and pause control. Includes three 1/4" headphone jacks, extension speaker jack that doubles as an eighth jack, a digital counter, cue-review button, auto shut-off and high-quality 3" speaker. Up to two watts of power. 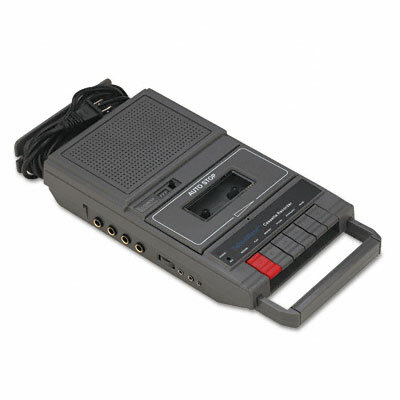 Features a built-in microphone, LED recording/power indicator, automatic record level and pause control. Includes three 1/4" headphone jacks, extension speaker jack that doubles as an eighth jack, a digital counter, cue-review button, auto shut-off and high-quality 3" speaker. Up to two watts of power. AC/DC operation and permanently attached 5-foot AC cord.